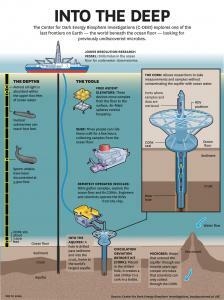 The CORK allowed sampling below the seafloor without contamination from ocean water. Credit: USC. The GeoMicrobe, package of sampling instruments, ready to be plugged into the CORK. Credit: WHOI. Two miles below the surface of the ocean, researchers from the University of Hawai‘i at Mānoa and colleagues discovered new microbes that "breathe" sulfate -- that is, gain energy by reacting sulfate with organic (carbon-containing) compounds. The microbes, which have yet to be classified and named, exist in massive undersea aquifers -- networks of channels in porous rock beneath the ocean where water continually churns. About one-third of the Earth's biomass is thought to exist in this largely uncharted environment. Using DNA sequencing, a team of UH Mānoa researchers has spent the last few years accumulating strong evidence that this area of the deep subsurface harbors unique microorganisms. It’s a massive biome dominated by microbes that scientists know very little about. “That’s what makes this recent work exciting - while we suspected it in the past, we now have DNA sequence data linking sulfate reduction to some of these new and novel microorganisms,” said Michael Rappé, associate researcher at the Hawai‘i Institute of Marine Biology (HIMB). Rappé, along with Alberto Robado (lead author; now at University of Southern California) and others, published a paper on the new findings this month in the open-access journal Frontiers in Microbiology. Sulfate is a compound of sulfur and oxygen that occurs naturally in seawater. It is used commercially in a range of applications -- from car batteries to bath salts -- and can be aerosolized by the burning of fossil fuels, increasing the acidity of the atmosphere. Microbes that reduce sulfate are thought to be some of the oldest types of organisms on Earth and have previously been found in marshes and hydrothermal vents. 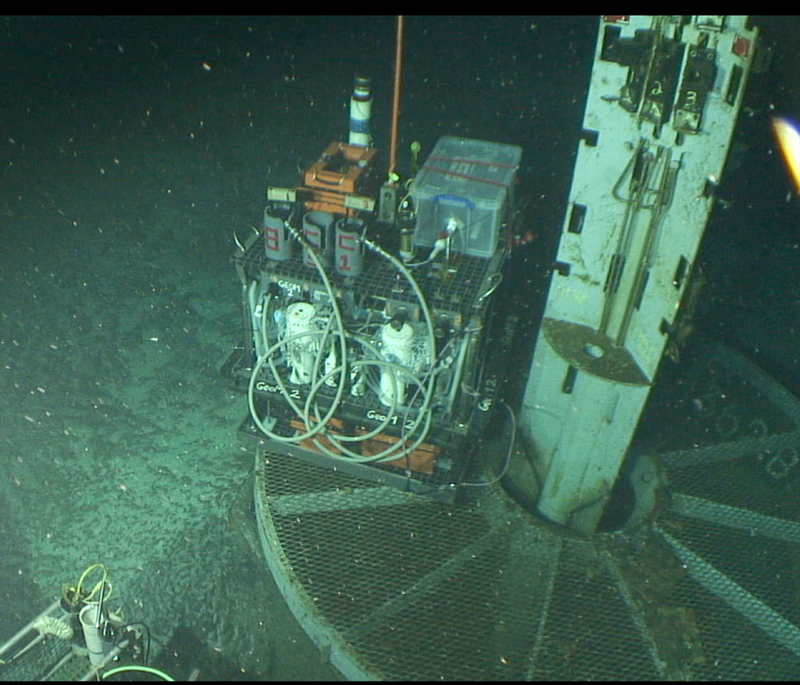 Microbes beneath the ocean's crust, however, are incredibly tricky to sample. Researchers took samples from the Juan de Fuca Ridge off the coast of Washington state, where previous teams had drilled into the ocean floor by lowering a drill through two miles of ocean and boring through several hundred feet of ocean sediment and into the rock where the aquifer flows. 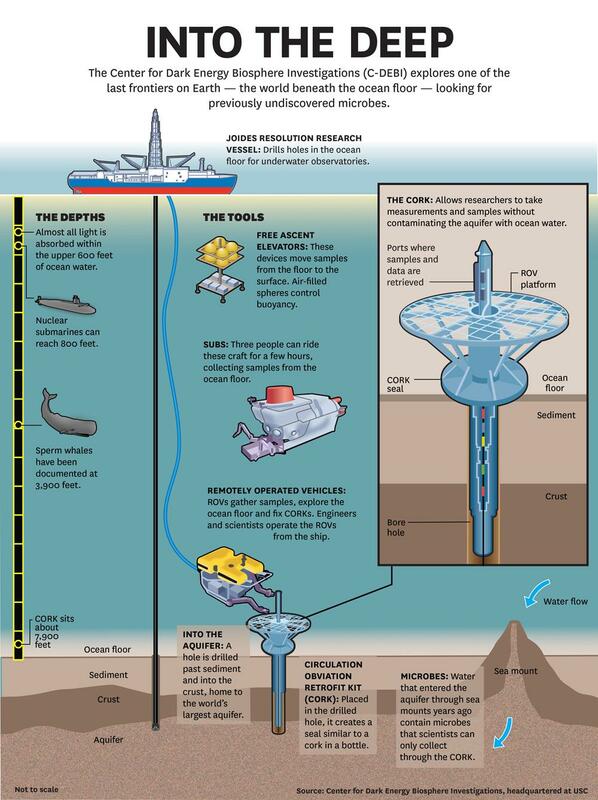 The holes were then fitted with Circulation Obviation Retrofit Kit observatories, or CORKs, which provide a seal at the seafloor, like a cork in a bottle or a wellhead, allowing scientists to deploy instruments and sampling devices to a borehole in order to collect deep subsurface crustal fluids, while keeping ocean water out. “This study would not have been possible without the many years of effort by our late colleague here in Hawai‘i, Jim Cowen, who spearheaded the design of CORKs to be more friendly for fluid sampling, and designed new sampling equipment capable of traveling two miles or more to the bottom of the ocean, pumping up crustal fluids from deep below the seafloor, and bringing those samples back to the ship without contaminating any of it with sediments or seawater. It took tremendous vision and dedication by Jim for us to now be able to routinely achieve this feat and perform experiments such as those described in our current study,” said Rappé. Like the microbes on the forest floor that break down leaf litter and dead organisms, the microbes in the ocean also break down organic -- that is, carbon-based -- material like dead fish and algae. Unlike their counterparts, however, the microbes beneath the ocean crust often lack the oxygen that is used on land to effect the necessary chemical reaction. Instead, these microbes can use sulfate to break down carbon from decaying biological material that sinks to the sea bottom and makes its way into the crustal aquifer, producing carbon dioxide. Learning how these new microbes function will be important to getting a more accurate, quantified understanding of the overall global carbon cycle -- a natural cycling of carbon through the environment in which it is consumed by plants, exhaled by animals and enters the ocean via the atmosphere. This cycle is currently being disrupted by man-made carbon dioxide emissions.